The Aughton & Ormskirk U3A has been organising Short Courses for its members over many years. These courses can be anything from three to ten sessions and have in the past covered a diverse range of subjects such as egyptology, astronomy, geology, poetry, painting, stained glass, meditation, ballroom dancing etc. Suggestions for short courses are always appreciated and are particularly welcome from U3A members who would be prepared to run or organise one themselves. If you are inspired by these courses, please offer to run one in 2017 if you can. In addition to the above, individual special interest groups sometimes run courses on their subject. Ballroom Dancing is putting on a 10-week course of dancing lessons for beginners starting in September. Church History is running a new series of talks and visits on Cathedral Architecture starting in October. Computer Courses group occasionally runs classes such as the the Tabets or Smartphone? Workshop advertised in the flyer. The Getting Started with Tablets course was run in October as well as a couple of times earlier in 2016 and 3 times in 2015. See the Computer Courses group page for future courses and workshops along with contact and booking details. 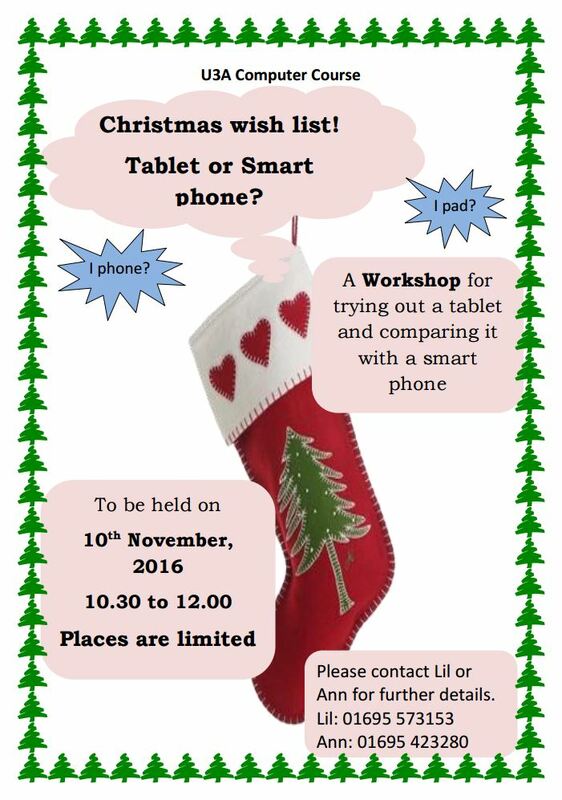 Click or tap on the Poster for info on the November 2016 workshop – relevant to the pre-Christmas period as we pondered over suitable techie-type presents. Contact the Learning & Group Support Sub-committee, on 01704 889736 or email groups@aughton-ormskirk-u3a.co.uk with any suggestions for a short course and offers to run one. Information is available on how to start a short course. The ukulele is a fun instrument and very popular at the moment. It only has four strings, simple chords and No fees are involved, other than the normal £1 per session, and there’ll be a cup of tea/coffee and a biscuit to fortify you. For more information contact Tony as soon as possible – telephone 01695 421602. PS There are no plans for future beginner courses but we hope to start a group for people who can play a few chords already. Watch this space! HEALTH WARNING! Playing the ukulele is addictive! Would you like to understand more about the value of the foods we eat and enjoy, what contribution exercise can make and how small changes can lead to a great difference to health? Nicky Garforth is well-known to many of our members for her Aerobics and Aerobics Lite classes. Following numbers of requests for advice about general health and nutrition, she is offering a 12-week course, developed with the Netherton-based charity ‘The Feelgood Factory’, to give the 15 participants the opportunity to learn about nutrition, healthy eating and practical cooking. The challenge is to set manageable goals, and alter both nutrition and lifestyle, all in line with Government guidelines. Attending all 12 sessions is an important part of the course. The cost includes hall hire, all course materials and three demon­stration visits from Malcolm, the food and nutrition worker and qualified chef of The Feelgood Factory. The course will run only when 15 members are registered. The deadline for booking is 12 January. Please contact Eila Wall on 423 341 if you would like to join the course. The U3A Memory Course has been designed especially for later life learners in informal adult learning situations. It explains how our memory works, aims to reduce anxiety about our memory problems and enables people to change their lifestyle behaviour and so prevent or reduce the risk of developing dementia. It is also practical and fun! A message from the Aughton and Ormskirk U3A Memory Course Team to Aughton and Ormskirk U3A members. We have now run the Memory Course for our Aughton and Ormskirk members 17 times, with over 200 members attending the course. Starting in 2009 and running till March 2016 it has been some journey! We’ve learned a lot, laughed a lot and met a lovely, interested group of people. So thank you, to all those who attended, you made the course into something good. So good that over 60 U3As in the UK are running the course in their area. However, we as a team do need a break, and other commitments have grown. So unfortunately we do not envisage running the course again in the near future. PS This endeavour lives on elsewhere – please see this message about the Memory Course for members of other U3As. We’ll start at the beginning with sitting and holding positions and explore song accompaniments using brush strokes and finger picking with some very basic chords. No previous knowledge or ability to read music is required and I have a couple of guitars that can be borrowed for the duration of course if needed. Contact me for more information and to book. Wellbeing Course: Exploring ways to maximize happiness and health in older age. Topics explored include: Planning your future; Forming new friendships; Managing your emotions; Maximising your health. Cost: £10.00 for the 7 weeks. This is a small group, run in a friendly, relaxed home environment. Included are refreshments, course notes, and an optional 1-1 health check. If you would like to join us please contact me: Judith Crimlisk: Senior Nurse Adviser (Ret.) 01695 421602 if you would like to attend. This is a repeat of the very successful course run in autumn 2012. If you missed out on Chemistry at school, but would like to know more, this course is for you. The course is designed for those with no, or very limited, knowledge of chemistry perhaps from school days and those for whom Chemistry is ‘rusty’ and would like to update. Learn basic Chemistry through simple topics linked to the real world. The course will start with the chemical elements, leading up to examples such as ‘water’, ‘diamonds’, ‘atmosphere’ etc. to illustrate the uses of these basic ideas in subsequent lessons; included will be some simple practical experiments with readily available chemicals – washing soda, vinegar etc. as well as the use of molecular models. Numbers will be limited and you must enrol in advance. A six-week course on playing the ukulele for absolute beginners. No previous musical experience required, but applicants must have their own ukulele and be able to attend on all the above dates. The ukulele is a fun instrument and very popular at the moment. 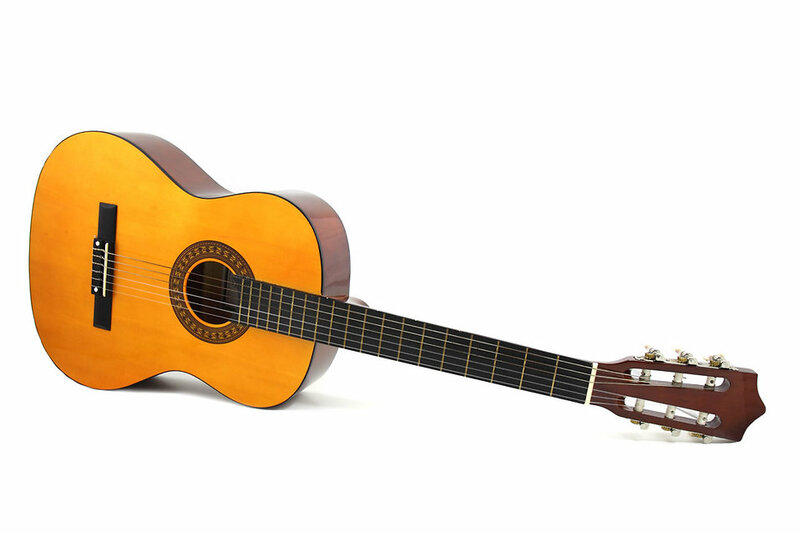 It only has four strings, simple chords and we’ll be learning to play and sing a variety of well-known songs. 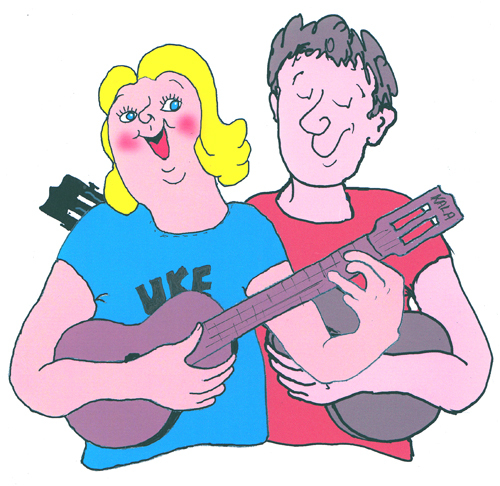 There are three main sizes of ukulele: Soprano, (the smallest and cheapest at around £20), Concert and Tenor. There’s also the hybrid ukulele banjo. Choose one that suits the size of your hand (and your pocket). For advice go to any music shop or contact me before you buy. No fees are involved, other than the normal £1 per session, and there’ll be a cup of tea/coffee and a biscuit to fortify you. Numbers are limited, so if you’re interested contact me as soon as possible on: telephone 01695 421602.